Happy Halloween, everybody! 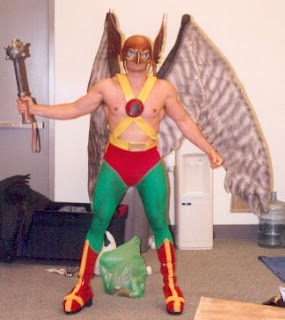 In honor of the one night a year where it's perfectly acceptable to dress up in a ridiculous costume AND beg for candy throughout your neighborhood, here's a few Hawkman costumes I found online. He's a bit tougher to put together a costume for, but it's doable. Have a happy and safe Halloween folks! Summary: With Thanagarian criminal mastermind Byth exiled to the primitive planet of Earth, Wingman Katar Hol is hailed as the latest in the long line of "Thanagar's Heroes," including his own father, Paran Katar. This makes his growing disillusionment with the rigidly structured Thanagarian society troubling for both Katar and his superiors. The Wingman chief, Andar Pul, doesn't want Thanagar's Hero risking his life on patrol, but Katar will hear nothing of it. Andar responds by ordering Katar's partner Shayera Thal to keep her eyes on him, and take him out if need be, because "Thanagar's Hero" can always be replaced. Afterwards, after Katar checks with his government mole Kanjar Ro, Shayera gives Katar a piece of her mind, telling him that he has to get over his "liberal guilt" about his station in life and do his duty. On a patrol, the Hawks investigate a pair murder victims who have had their faces skinned off -- the calling card of the Manhawks. Their investigation is interrupted when they run into a Downsider kid who Katar knows. Katar wants to help the boy, but he leads them into an attack by another Downsider named Bladebat, whom had lost his hand in a previous fight with Hol and replaced it with a knife. Things get more complicated as they are then ambushed by the Manhawks. After a brutal three-way battle, the Manhawks retreat, Bladebat loses his other arm, and the boy is killed. As Shayera says, they don't know any better, because "Once a Downsider, always a Downsider." The Hawks are then given their new assignment: Earth. Review: Well this certainly is a change of pace from what we've been reading on this site, huh? A dark and grimy tale of corruption, totaltarianism, and class warfare, this is very clearly a very different take on Thanagar and it's resident heroes. Truman is in full allegory mode here, turning what was once a pretty simple science fiction property and using it as dystopian social commentary. It's not bad, I just wasn't expecting it to be this thick, honestly. It's very odd to see Katar feeling guilty about being considered a "hero," but considernig the Post-Crisis landscape I guess it's unavoidable. Graham Nolan's artwork is very nicely done, giving a sort of British, understated vibe to the proceedings which works well. I especially like the redesign of the Manhawks, which loses the grace of the Silver Age design in exchange for a horrific, Cronenberg-like appeal. As a launch for a new series, this is pretty good, but after this initial reading of the Hawkworld continuity, I still like Silver Age Katar better. Image: Hawkworld v.2:no.1, 1990, Graham Nolan. What new funnybooks are coming out this week that feature the Winged Wonder? Let's take a look! DC Universe Decisions #4 -- The final issue. At least DC got it all out before Election Day. Justice Society of America: The Next Age TPB -- If you missed the start of the new (but still aweomse) JSoA series and thought the HC was too prciey, now is your chance to get caught up. Rann-Thanagar Hol War #6 -- As this series goes on, I keep getting more anxious to get the trade to read it. What will become of Hawkman as we know him? Will Katar be back? Will Carter stick around? What about my pet theory? I need to know this stuff! Title: "The Masked Marauders Of Earth"
Summary: In Midway City, an entire jewelry store is bizarrely stolen by even more bizarre thieves: giant hawks wearing vaguely humanoid masks who shoot beams from their eyes. The store is returned, but with two large rubies missing. Police Commissioner Emmett contacts Hawkman on Thanagar, who recognizes the thieves as the Manhawks, a roving band of criminals who introduced the concept of theft to Thanagar years earlier. This new rash of crimes -- Thanagarians committed thefts for the sheer thrill of it -- forced Katar Hol's father Paran Katar, to turn his anti-gravity belt and artificial wing inventions (originall devised to study birds) in the tools of combat. Katar used his father's invention and infiltrated the Manhawks, then stole one of their masks and reverse-engineered it's weapon, developing a counter-measure: the Hawk helmet, complete with shields against the Manhawks' eyebeam attacks. Rendering their weapons ineffective, the Manhawks were quickly put in prison, but the damage had been done; crime was now on Thanagar, and thus Paran's inventions were used to arm the new police force. The Hawks make their way to Earth, armed with the same counter-measure Katar had used earlier against the Manhawks. But, their foes have deduced this one, and their eyebeams are now resistant to the Hawks weapons. Planning to strike at Thanagar, the Hawks probe their Earth history, and figure out that rubies are needed to make a laser beam. They attack the Manhawks ship, then use a black chemical rain to negate the Manhawks' eyebeams (not having enough light to properly amplify, the attacks are not very dangerous). The Manhawks are captured and imprisoned on Earth. Review: The second feature-length Hawk adventure in a row is as good as the previous one. We get more great Katar and Shayera interaction, a crazy new set of villians, and more Thanagarian backstory, which is always welcome. Plus, this story will always be remembered as the case on which Hawkman earned his Honor Wings, and regained his classic winged helmet look. There's some typically murky Silver Age Science going on, but the story is fun enough that you roll with it, which has been my experience with such SAS so far in reading DC's from the period. 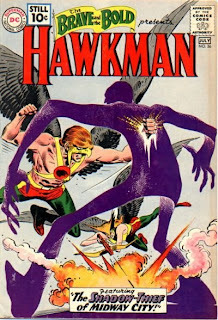 The Manhawks would eventually return a couple more times to menace Katar and Shayera during the Silver and Bronze Age, and would be re-imagined in a substantially more gruesome manner in the Hawkworld series. Really fun DC science fiction tale. Image: The Brave And The Bold #43, 1962, Joe Kubert. Title: "In The Hands Of Fate"
Summary: Arriving back at Stonechat after his dinnre with Ray Palmer, Carter is surprised by the arrival of his son Hector, AKA Dr. Fate. Hector explains to his father that he has now been caught up in his parents cycle of reincarnation, and takes Carter on a mystical trip back to Ancient Egypt, where he explains that not only are Khufu and Chay-era destined to be reborn again and again, but their treacherous high priest Hath-Set is destined to kill them again and again. Fate then warns that the circumstances behind Carter's resurrection, and other changes such as his presence in the cycle, have made the future unpredictable and dangerous. Meanwhile, tossing and turning in her bed, Kendra has flashbacks of her own, as she remembers a traumatic attack by a pair of police officers on her and her mother when she was only a child, which resulted in the death of one of the officers. Not wanting to be alone with her memories, Kendra goes to Stonechat seeking out Carter, where she tells Carter that his complete withdrawl from her life hurt her. But the discussion is interupted as the dead body of a Yeti is dumped through the roof, with a message about Kendra's uncle Speed attached to it. 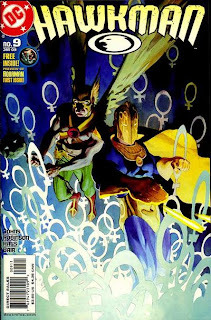 Review: It's weird to get a guest star again after just having one last issue, but considering the new connection between Fate and Hawkman I guess it's okay. Johns is clearly doing his worldbuilding stuff here and that's just fine with me, because it's really well done. The idea of Dr. Fate being part of the resurrection cycle is interesting in that it is a bit of a departure for the character, who typically was passed to helm-bearer to helm-bearer; I get the feeling that Johns was trying to make the "true" or "definitive" version of the character like he was doing with Hawkman. Does anything even need to be said about Rags Morales at this point? The Yeti seems to me to be a sly reference to the Silver Age story "Valley Of The Vanishing Men!" Image: Hawkman v.4:no.9, 2003, Andrew Robinson. This trading card is a part of DC's 1993 "Cosmic Teams" cardset. This set was interesting in that it was almost entirely focused on teams, as the name implied. 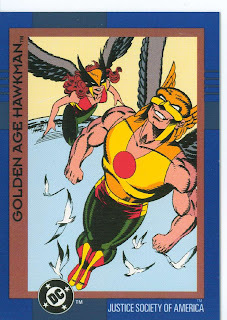 Since Hawkman was a member of the then recently released from Limbo Justice Society of America (before Zero Hour where most of the team was killed or otherwise weirded up), he is featured on his own card, as well as on the Justice Society's triptych, which I will post another time. Note that he is called out as the Golden Age Hawkman. The card art is by none other than Mike Parobeck, who draws a pretty sweet pair of Hawks, I must admit! Maybe I can make a banner ouf of it or something. 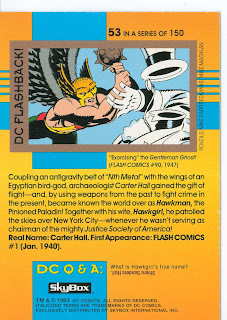 Image: DC Cosmic Teams Hawkman trading card, scanned from personal collection. The main appealing feature of Hawkman is, to me, his appearance. Moreso than any element of his personality, history, or back catalog, the look of the character is the most easily identifiable aspect of what has made Hawkman viable for 70 years. Hawkman stands among fairly rarified company when it comes to his look -- that is, how his look pretty much resisted change. Of the DC Golden Age characters who were revived in the Silver Age, very few retained their classic apperance: Aquaman changed his gloves, Green Arrow and Black Canary stayed pretty much the same, and the the Hawks. In fact, one might even argue that Hawkman (and Hawkgirl) stands nearly alone in this aspect, since, like Superman, Batman, and Wonder Woman, Aquaman and Green Arrow had been published continually since the 40s, while Hawkman disappeared with the end of the Justice Society's run in All-Star Comics in 1951. So Hawkman, Hawkgirl, and Black Canary alone went idle and then came back with the same look as they had in the "old days." And why shouldn't Hawkman have retained his classic look? His is amongst the most striking heroic character designs of any era. The barechested warrior, with a fearsome helmet, a large weapon, and broad, raptor-like wings is a distinctly unmodern style, instead tying itself to classic fantasy elements, giving Hawkman a timeless quality. Appropriate, considering that the Golden Age Hawkman is a "timeless" character, dealing with reincarnation and ancient civilizations. 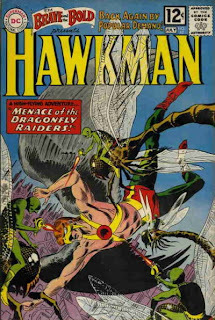 And, at the same time, the science-fiction setting of the Silver Age Hawkman does not negate this historical aspect -- tales ranging from John Carter to Buck Rogers and beyond utilize fantastical styles in a science-fiction setting, and the Silver Age Thanagarian Hawks fall into this category as well. 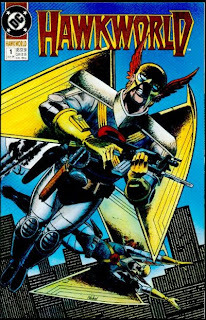 In the 80s, when Tim Truman redesigned Hawkman for the Hawkworld miniseries (and later, ongoing), he moved more into a "hard" sci-fi design, with the black body suit and space-age weaponry. But even in this iteration one can make the fantasy connection, simply filtered through a modernist sci-fi approach. And even with the sci-fi elements, the same basic appearance remained unchanged, with the wings and menacing helmet in place. Clearly this look has it's fans; after all, that's what first attracted me to the character. It's appropriate for a character like Hawkman, who has had two wildly different approaches during his existance, to have had such a consistant look over the same period. Comics are a visual medium, and having a striking look is just as important as a compelling story when trying to make a hero popular. The looming figure of a warrior, looking like he stepped out of a time warp, armed with ancient weapons, his face covered with the helm of a bird of prey, and sporting a set of wings from his back will simply never go out of style, and remains a key element of Hawkman's long-lasting appeal. Image: Hawkman sketch, Mike Grell, date unknown. Hey everyone, heading to DC for a few days for work. I'll be back Wednesday night so I hopefully will have some stuff for your enjoyment on Thursday. Sorry for the inconvenience. Washington DC, huh? Does Themyscira still have an embassy there? Summary: After reading about several assassination attempts on heads of state, including the President, Carter Hall happens upon an attempted murder on the street. Saving the young woman, he soon learns that her name is Ione Craig, and that she is a secret agent. Her mission is to go to Araby and get to the bottom of the Sect Of Assassians, who are behind the assassination attempts. Carter decides that she needs a bodyguard and follows her as Hawkman. Ione is kidnapped from the market district in Cairo, and taken to the palace of Hassan Ibn Sadah, the head of the Sect. Sadah plans to kill off the leaders of several countries at once and place Sect puppets in their place, effectively making him ruler of the world. Hawkman infiltrates the palace nd kills one of the assassians with his sling, but then retreats before Sadah's archers can get him. Returning after dark, Hawkman attacks the hundreds of assassians head-on, frees Ione, and kills Sadah with one well-placed sling shot. With Sadah dead, Hawkman figures the Sect will soon fall, and he and Ione escape to the desert. Review: A short and sweet yarn, which is appropriate considering Hawkman himself expresses similar sentiment about the adventure! Taking Hawkman out of the cityscape gives Moldoff a chance to draw some more fantastical elements, including an Arabian palace and lots of assassians and thugs who look like they stepped out of a Sinbad movie. Hawkman is especially brutal this time out, killing two men in the span of ten pages. Worth noting is that the story in the next issue of Flash Comics actually picks up right where this one left off, a first for Hawkman. 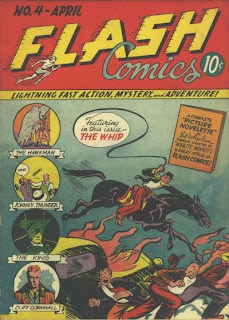 Image: Flash Comics #5, 1940, Jon L. Blummer. Title: "The Menace of the Dragonfly Raiders"
Summary: Katar and Shayera return to Thanagar to report to the Chief of Police, Andar Pul. After debriefing the couple on what they have been up to and what they have learned on Earth (allowing for a recap of previous adventures, including with Byth, who is in prison, and the Matter Master), he gives them some time off. Soon they discover that Thanagar is being victimized by tiny thieves who ride dragonflies, and bizarrely use Terran criminal methods. Soon it gets even stranger as it is revealed that the tiny thieves are actually robots, and the dragonflies commit the crimes themselves! Katar suspects that somehow Byth, who had previously ingested a formula to change his shape at will, is behind the crimes, but he appears to be still incarcerated. Stuck without a new lead, the Hawks pay a visit to the Veil of Valmoora, which is where Katar and Shayera first met years ago. On that case, the rookie Shayera saved the older and more experienced Katar's life, which helped create the bond between the two of them. Inspired by her memories, Shayera devises a plan to bring the robbers into the open by displaying a "gem tree" the dragonfly raiders can't resist. The raiders do as suspected, and the Hawks trail them by following the trace radioactivity planted on the gems. They discover that Byth is behind the crimes, having had the necessary elements for his formula smuggled in on envelopes. A furious battle begins, with the raiders changing into all sorts of strange alien creatures. It the end it comes down to Hawkman and Byth, who has changed into a Mirage Bird, which is able to create a falsh duplicate image of itself. Katar is able to outwit Byth, and the mastermind is once more locked up -- this time without access to envelopes. For his bravery in solving the crime, Katar Hol is awarded the Honor Wings, which are permanantly attached to his helmet. Review: We get a lot of Thanagar in this issue, the first full-length Hawkman story since the character was revived in 1961. Although I do wonder why there was a year between Hawkman stories? Did they want to retool him into being a straight space hero with adventures on Thanagar, perhaps? I don't know. 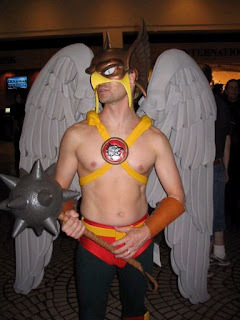 The addition of the Honor Wings brings the costume back full-circle to the original, Golden Age look, as well as the look that most fans think of when they think of Hawkman. The team of Fox and Kubert are very easy to read on the Hawks, this story included. The extra legnth allows them some time to play around and add details which are appreciated, including the "meet cute" of our couple. I really enjoyed the history between Katar and Shayera and the explanation for the wing harnesses. And it's good to see Matter Master again, even if it is a flashback. Image: The Brave And The Bold #42, 1962, Joe Kubert. 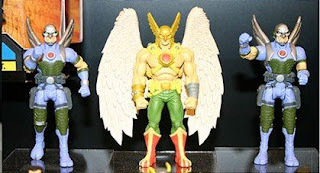 This three-pack from Mattel's 3 3/4" "Infinite Heroes" collection, features a modern Hawkman along with a pair of Thanagarian Wingmen to back him up. This inclusion of "Army builder" type figures is not new to the line: a currently available three-pack features Commissioner Gordeon and a pair of GCPD officers. I do think it is interesting that they went with the modern Hawkman look, complete with the weapon-festooned belt, instead of the Hawkworld-era costume. But then again, that was a long time ago, and maybe I should just let it go, huh? 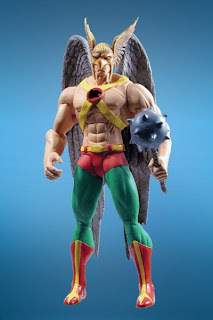 Of course, they could have also gone with a true "Hawkman" three-pack, with Golden Age Carter wearing the mask instead of the helmet, Modern Carter, and Hawkworld Katar, but now I am just pipe-dreaming again. I have not yet seen this set in stores, but I plan to buy it, if only because how many other chances will I have to get some Wingmen toys?! Probably not too many I imagine! Image: Infinite Heroes Hawkman and Wingmen, retrieved from Joe Acevedo.com. Is there any Hawk-related stuff coming out this week? Let's find out! DC Universe Decisions #3 -- I don't even know if Hawkman is in this or not, but a series about politics in the DCU pretty much is going to feature him at some point. Don't wait up looking for a review here, folks. Justice Society of America #19 -- This is more like it! As the Gog storyline proceeds, it's clear that Geoff Johns has plans in store for the Winged Wonder. What will go down this month? One thing DC Direct is pretty good at doing is reproducing a good likeness of an artist's work in three dimensions (some artists better than others, obviously). That's what we have here with this toy, from the Identity Crisis line, based on the cover artwork of the miniseries by the late Michael Turner. I never cared all that much for Turner's sequential work, or for his female form, honestly, but as far as doing pinups and covers, he had a good style which really looked unique, and the DCD boys do a good job of capturing that unique style here. This is a tall figure, standing about 7" at the tips of his Honor Wings, which are about even with his actual wings. Between that and his base, he easily stands head and shoulders above a lot of other toys. The sculpt itself is very nice, reproducing the lean and musclular look which Turner was known for. I like the broad chest tapering down to the narrow waist -- an uncommon look for Hawkman, but put to good use here. The helmet is overstated and a bit exagerated, with very tall Honor Wings and piercing red eyes peering out from the slits. But, like the covers, this look works for him, making Hawkman look inscrutable and not a little ticked off at the world. His colors are bright and vibrant, and the morningstar accessory well-proportioned, though I would have liked a wrist loop. I want to specifically talk about the wings, which are my favorite part of this toy. Though not the broadest set of Hawkman wings ever, they are extremely well sculpted, with the details of each individual feather pulled out very nicely from the paint and wash applications applied to them. They mount on ball joints, and thus are very posable. The sleek look of the wings does a lot to sell the Turner look for the figure, which to me is a big selling point for lines like this. If it's based on the artwork of an artist, it should look like the artwork of the artist. This is a good representation of both the character and the artist. So I would recommend this toy for both Hawkfans as well as Turner fans (along with the rest of the Identity Crisis line), but be forewarned -- these can be pricey, as I paid $15 for Hawkman. But if that price doesn't make you balk, this is a good purchase. Image: Indentity Crisis Hawkman, retrieved from DC Direct. Summary: A man has his future foretold by the Thought Terror, and is informed that he will become intoxicated and then die when he is hit by a car. Later that evening, the man begins to feel drunk even though he has not had anything to drink. As a car bears down on him, the man is saved by passer-by Carter Hall, who takes the man home, thinking it strange that he acts drunk but has no alcohol on his breath. Carter figures that the Thought Terror was hypnotizing his clients and then making the predictions come true. Hawkman flies off to investigate, first interrogating the driver and then going after the Terror himself. He runs into trouble with the Terror's mesmerized guards, who in their hypnotized state are unstoppable. He is captured and thrown in the dungeon. Shiera finds the dungeon, and then brings Hawkman a blowtorch by which he manages to escape. Hawkman then tries to find his shield, which he will use (like Perseus and Medusa) to avoid the hypnotic stare of the Terror. Finding his weapon, Hawkman uses the shiny shield to reflect the Terror's hypnotic stare back on himself, changing him mentally into a harmless kitten. With the Terror's mind no longer able to control those he hypnotized, his victims and henchmen return to normal. Review: Much better than the previous Golden Age adventure, this tale of hypnosis and extortion was a lot of fun despite being a fairly quick read. The Thought Terror makes for an interesting villian (who sadly never re-appeared), and his come-uppance at the end was well deserved and amusing. 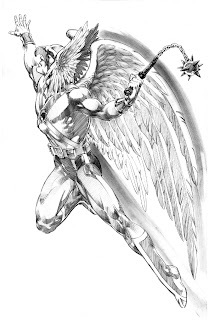 This is the first time that artist Sheldon Moldoff would provide art for Hawkman, and he is a good fit, building upon the Alex Raymond look which Neville had in the previous installments but starting to move away from the science fiction look into more of a fantasy style. It fits the characters very well, especially here with the hooded and robed baddies and Hawkman wielding an ancient shield. 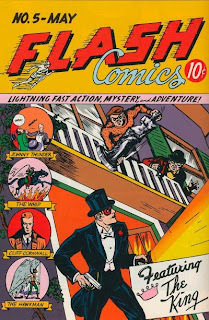 Image: Flash Comics #4, 1940, George Storm. No, not Midway City (which is in Michigan), but that OTHER Midway, Chicago! Of course, the Hawks have been known to take wing over the Windy City as well, so it's still thematically appropriate. Another batch of awesome Hawkman artwork, once more courtesy of Honor Wings recepient rob! (whom you can check out at The Aquaman Shrine, and lotsa other quality comic book blogs) from Superman And Batman Magazine #5. Our story is written by Phil Kupperberg, with art chores handled by Rick Burchett. It's a fun story, the basic bones of which would not have been out of place as a Bronze Age backup tale or what-have-you. Hawkman musing on the nature of the Declaration of Independence versus the strict totaltarian rule on Thanagar is a good hook for this version of the character. The art does a good job of emulating the "Adventures" animated look, and the Hawkworld Hawkman once more looks pretty dang cool in this style. I like that Hawkman switches from high-minded intellectual concerns about freedom and liberty to calling out punks and smashing their faces in so easily. 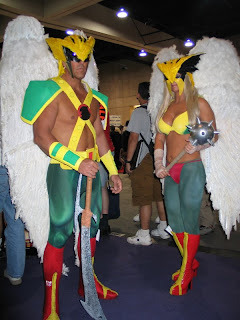 That's how we roll... Thanagarian Style! Do you have something neat which is Hawk-related? Some cool images or rare finds? Send them along and you too can earn your Honor Wings! Title: "Shadow-Thief of Midway City"
Summary: Hawkman and Hawkgirl are recalled to Thanagar by their superiors, but before they can head home, a strange shadowy creature robs the Midway Bank right in front of the helpless security guards! The Hawks give chase, but the two-dimensional Shadow-Thief is able to escape since they can't lay a hand on him. With their sharp vision, though, they are able to see his profile, and identify him as Carl Sands, convicted burglar recently released from prison. Conveniently reminiscing, Sands recalls how he became interested in shadows and light while in prison, and how he accidently discovered another dimension by messing with a color-disk projector. A being in the other dimension, Thar Dan, was in trouble, and was saved by Sands' meddling. Rewarding his savior, Thar gave Sands a device known as the Dimensiometer, which gives Sands his two-dimensional abilities. Unfortunately, if over-used, the device will destroy the Earth by creating another Ice Age -- a fact Sands was unconcerned with. The Hawks spring a trap on Shadow-Thief when he commits his next job, trapping him in the air. Realizing that he needs to become three-dimension to escape, Sands tears the Dimensiometer from his wrist, but that is his downfall, as the Hawks are able to catch him in that moment. As for the device itself, it is now ruined -- just one activation away from causing a new Ice Age. Review: The most well-known of Hawkman's Rogues Gallery (admittedly not a huge feat, considering) makes his first appearance here, and Shadow-Thief is so well realized, that while some of the details changed, his basic motif has remained the same ever since. A thief makes a great foe for a museum curator, and when you have heroes who rely on weapons, making him a shadow who cannot be touched is brilliant. Definitely the "A" story from this issue, with lots of action, police work, and the always-awesome Kubert art, especially on the strangely proportioned Thief. So far, this has been one of my favorite stories in the first Showcase volume. Image: The Brave and The Bold #36, 1961, Joe Kubert. 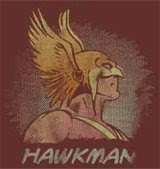 While searching the Intarweb for a Hawkman t-shirt (of which there are sadly very few! ), I came across this little gem. Get this though: It's a shirt for infants! That's right, The Retro Baby sells actually sells retro, "Junk Food" style clothes for infants up to 24 months of age. How bizarre is that? With the geeks and nerds of the world going out and reproducing, I suppose it was inevitable, but still, this seems a little strange to me! 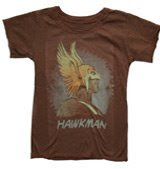 You can check out the listing for the Hawkman shirt here. They have other superhero styles, although I feel I should point out to some of my fellow bloggers that there is no Aquaman, Green Arrow, or Martian Manhunter stuff available at this time, while Hawkgirl shows up in a group shot with Batgirl, Wonder Woman, Supergirl, and Mary Marvel. Neener! Image: Hawkman infant t-shirt, and detail, retrieved from The Retro Baby. Today we have some very nifty Mike Parobeck artwork for you, thanks to rob! of Aquaman Shrine fame, as well as numerous other nifty comic book blogs, including his comic magazine project, All In Black And White For 75 Cents. These "Hero File" pages come from Superman And Batman Magazine #5, dated Summer 94. Parobeck's depiction of the Hawkworld-and-later Katar looks striking, and I imagine this interpretation of the character would have looked pretty sharp animated on the small screen as well. A big thanks to rob!, the first recepient of the Honor Wings titles for contributing something to my humble Hawk blog! Do you have something Hawk related? Send it along and you too can earn your Honor Wings! Summary: Carter Hall meets up with his professor friend Ray Palmer (AKA The Atom) at a fancy French restaurant to discuss Carter's recent return to the land of the living (along with why he has brown hair). Meanwhile, Chief Nedal and Officer Isabella continue to look into the cold case of the murder of Hawkgirl's parents, finding a lead involving local baddie and counterfeiter Warwhip. Hawkgirl rushes the villain at his apartment, who not only seems to be into using his whips in the bedroom but also can create whips of flesh from out of his arms. As the pair struggles in the sky over St. Roch, Chief Nedal shoots Warwhip dead. Kendra, upset over another lead being dashed, returns home and can't sleep, feeling alone and pushed away by Carter. Ray tells Carter that he wants to study the Nth metal (to which Carter agrees), and advises his friend that love is a complex and powerful emotion, stating that he got married because "it was the smart choice" and not necessarily the right choice, and so Carter must be careful with how he treats Kendra and what he expects out of her. Carter flatly states that they are partners and nothing more. Bidding his friend adieu via long distance telephone line (paying for dinner as well, since he knows Ray still makes a teacher's salary), Carter returns to his bunk at Stonechat Musuem, only to have his rest interrupted by the sudden appearance of his son, Dr. Fate. Review: Let me just say that while the dislike between Hawkman and Green Arrow may be a bit much in this series, the friendship between Atom and Hawkman is pitch-perfect. 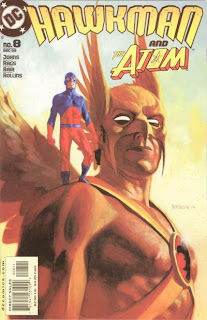 The notion of Hawkman and the Atom being friends taps into a lot of themes which work well (not the least of which is the big burly athlete who is friends with the weak nerdy guy), and its nice to see them played out here, even if Ray Plamer would go off the deep end a short time later. I like Carter's personality here, as well. After pushing too hard to win Kendra's affections, he is now stubbornly resigned to the "just partners and nothing more" attitude. 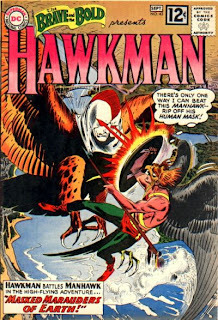 There are readers who don't like the hardheaded Hawkman but I like him, since it does help to differentiate him a bit from his contemporaries as well as help me identify with him. The subplot about Kendra's parents builds as well, with the bizarre Warwhip making for easy Hawk-fodder like Bloque was earlier. St. Roch is not exactly Central City when it comes to local baddies, is it? And Rags Morales' pencils remain consistantly excellent. There is not much action this issue, just a short fight with Warwhip, but even the quieter moments are handled really well. Despite the cliffhanger spoiling the "done in one" aspect, this is a very cool comic which fans of both the Winged Wonders and the Tiny Titan would enjoy reading. Image: Hawkman v.4:no.8, 2002, Andrew Robinson.